It’s hard to fathom how quickly the year has passed. Our summer weather has chilled and the holidays are nearly upon us. They feel even more impending after baking a turkey last week. It has been in the freezer for a while and I decided it should be cooked (even if only for the dogs!) before purchasing more. As it turns out, the turkey was DEEEElicious! I roasted it unstuffed and made dressing on the stove top (which included giblets, boiled eggs, black olives, mushrooms, celery and juice from the turkey). Even the dressing was wonderful. I ate it for a couple of days and fed the rest to the dogs. We all enjoyed it very much and I plan to purchase another small turkey or two soon. I’ve continued filling my spare time with sewing and knitting. I’ve finished the second blouse (using the same pattern as previously posted) but did not photograph it. I’ve worn it and received compliments but it’s nothing to cause excitement. Don’t expect to see me wearing it on the cover of Vogue! Recently, my microwave died. When I mentioned it to Jacob (who was packing for a visit here), he offered to pick a new one up on his way. I took him up on his offer but before leaving his house, he talked to his best friend and mentioned my needing a new microwave. The friend has just moved and his new digs included a microwave. He had recently purchased a new one which he no longer needs so he offered it. I tried paying him but he said, “Merry Christmas”. It’s a nice one! 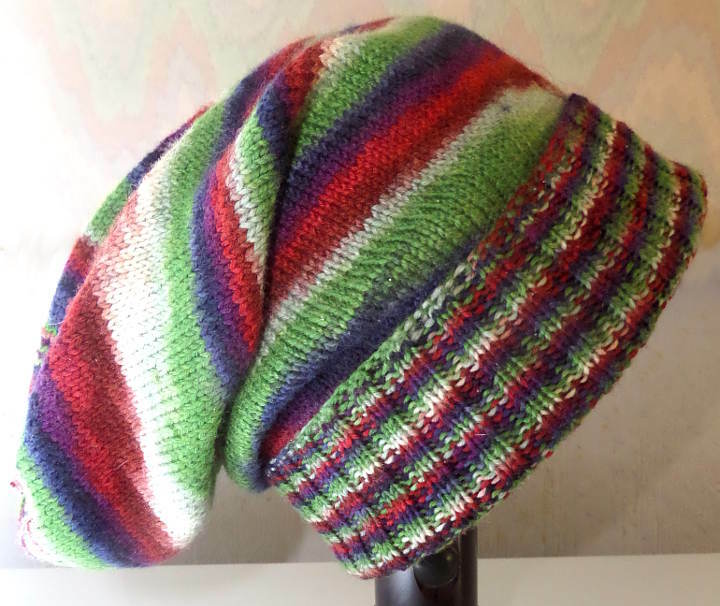 To offer a little token of my appreciation, I knitted him a Sockhead Slouch Hat. It was made using Knit Pick’s Painted Stroll sock-weight yarn in Renaissance colorway (modeled here placed over a bowl atop a flashlight). I hope he enjoys it! I’ll send it home with Jacob upon his next visit. I also managed to finish another pair of socks for Jake. Because I’ve been distracted by other projects, these socks took 6 weeks to complete (twice as long as usual). 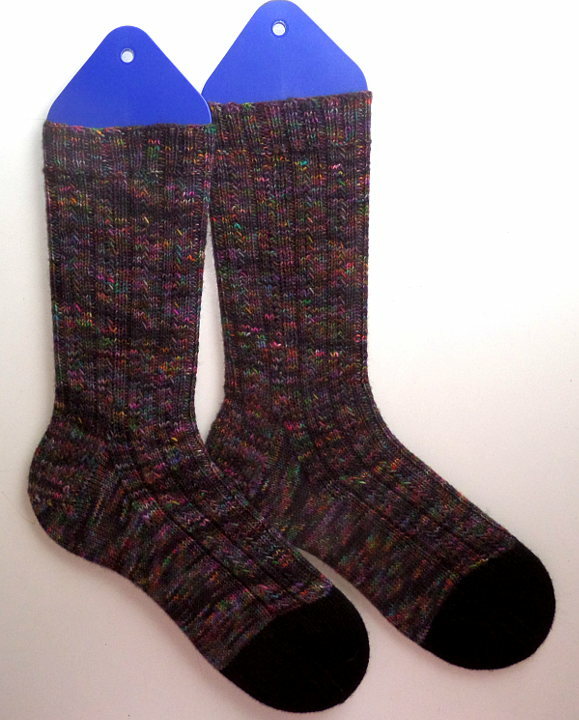 The yarn came from Witch Candy on Etsy in the colorway Oil Slick. I love this yarn! The pattern is a free one from Ravelry called Simply Skyp which I’ve made before. I like them! I finally got the results from my skin biopsies yesterday. As I suspected, they are basal cell carcinoma which is great news. One of the lesions is about the size of a dime. The Ear, Nose and Throat Plastic Surgeon wanted to remove it and cover the area with a skin graft until she noticed on my file that I’m allergic to epinephrine. Unfortunately, this eliminates the possibility of a skin graft and she feels the lesion is too large to stitch shut or leave open. I’m now being referred to a dermatologist in Tyler, where a neurologist and endocrinologist will be available if any complications arise. It is the ENT’s opinion the dermatologist will literally nibble away the lesion (no skin graft) and stitch it shut. I’ll have a noticeable scar but it matters not to me. My ‘pretty days’ are long over. The other much smaller lesion will be removed with little more than what was already done with the biopsy. I’m currently waiting to hear from the dermatologist and don’t expect anything to happen until next week or later. In the meantime, I’ll get a flu shot and prepare for the upcoming procedure. My fingers are crossed Jake will be able to come down for a visit soon. We had hoped he could come last week but something went out on his truck which required his immediate attention. He’s hoping to take a couple of days off work so we have a long weekend together. I’m hopeful! May the remainder of your week and coming weekend be filled with the joy of doing what you love. Keep us posted. Praying and loving you. Copyright © http://www.shirlsu.com 2017 - 2019 all rights reserved.